I imagine we have all listened to journalists and politicians explaining that the big issue with Brexit is that people voted for what they want but not how to realise it. Don’t worry this is not a political statement! It is, however, a typical conundrum of Agile Projects. APMG’s Facilitation certification using Process Iceberg is perfect for helping to manage the how. In organisations we all need to be working on the how in order to make it a success, as it could have significant impacts on business as usual, investments and improvement projects. Currently the political discussion is all around the first step of how without a clear process to reach consensus on the how. When considering facilitation, using Process Iceberg, the approach is split into the ‘what’ and the ‘how’. What (red thinking) covers the objectives of the task. How (green thinking) covers the way in which we can achieve the task. Sometimes it is a matter of needing agreement on what the problem is and at other times there is a need to find a solution. In the Brexit debate a great deal could have been achieved by having a structured approach to how, as the first step is to clarify the objectives. If the objectives of Brexit had been clarified to start with it would be much more straightforward to see whether a ‘deal’ is going to achieve the objectives. If we always ensure what is to be achieved is understood, with what must be in the deal or what could be in the deal, we are more likely to achieve it. The next thing we would do is to agree the process to achieve the objectives. The process is not simply to finalise withdrawal prior to a new trade agreement. These should be part of the objectives. The process is to identify the best format, tools and techniques to be used to deliver the objectives. Negotiation can use many formats in addition to a round table discussion. Techniques can help find options and solutions. The communication styles (and languages) are considered in addition to the individual preferences of those involved in the negotiations so that we can ensure we optimise all inputs. Taking this structured approach should enable emotions to remain neutral and allow objectivity in the negotiations. If things start to get heated we can easily diagnose which layer of the Iceberg needs to change to bring things back on track. 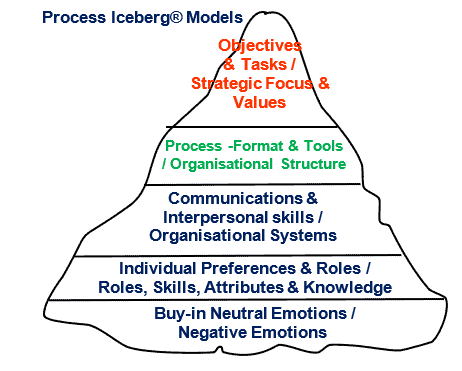 Essentially we have just worked through the layers of Process Iceberg which is the model put forward by Tony Mann in his book Facilitation Develop Your Expertise. This is the basis of the Facilitation qualification which is accredited by APMG. If you would like to avoid a ‘no deal’ outcome for your organisation join us for our next Facilitation course. Contact CUPE on Team@cupeinternational.com or call +44 (0)1202 555711.